I opened designer then picked out a photo to import, after that it crashed and quit on me. Any way to get this fixed so it can run smoothly? i’ve Tried rebooting the iPad and all the suggestions listed in the guide, but it still crashes. i’d like To be able to use it without any problems. 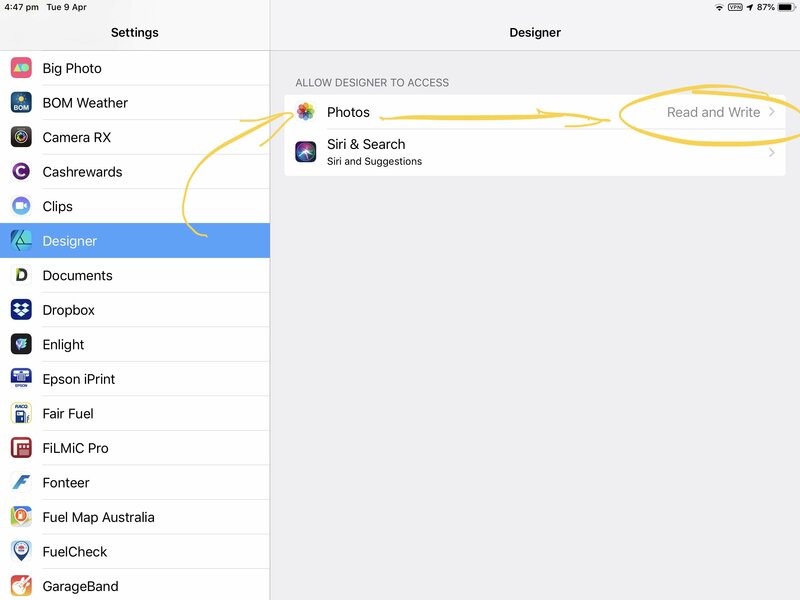 First thing to check is iOS settings for Designer. It must have read and write permissions set to on. For screen recording, open Designer and scroll down from top right to open Control centre. Tap to turn on the record button then swipe up towards the top right corner to close the Control centre. The screen is now being recorded. In Designer, do what you want (your actions are being recorded), when finished, simply scroll from top right to centre of screen to open the Control centre again. Now tap record button to stop the recording. Recording will be saved in your photo library.